One of the expected benefits from rising atmospheric carbon dioxide is that plants may use less water and avoid some of the damaging effects of drought. The basis for this effect is that plants close the pores called stomata on their leaves and less water is taken from the soil out through the plant and into the air. By taking in more carbon dioxide, plants can close their stomata earlier and this means they lose less water than they would otherwise. This publication "Water availability affects seasonal CO2-induced photosynthetic enhancement in herbaceous species in a periodically dry woodland" is Varsha's first scientific publication, issued in the highly-respected journal Global Change Biology (opens in a new window). 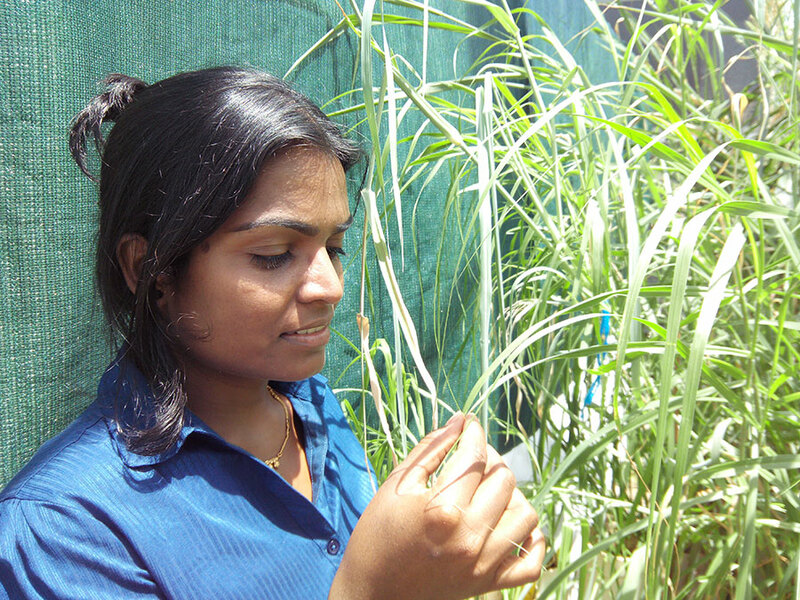 Varsha studies the physiology of grasses to understand the changes brought about by elevated CO2 on different species and types of grasses. This process has been tested extensively in cold temperate ecosystems such as the grasslands of the Northern United States where it was found that elevated CO2 produced a 'water-savings effect' by the reduced water use of plants, while driving the increases in photosynthesis and productivity. However, there has to date been little research on this effect in warm, dry ecosystems that cover much of the world in the tropical, subtropical and dry temperate regions including most of Australia. This creates questions around how much of the apparent benefits seen from rising CO2 in temperate ecosystems can be applied to ecosystems where drought and water limitation is much more common. Scientists expected that the presence of extra CO2 in the air of even warm and dry ecosystems such as Australian grasslands would improve their drought resilience as plants could take in more CO2 and close their stomata earlier. Testing this theory on Australian grass species has shown that it is the presence of water that controls whether plants open their stomata more and not because of the extra CO2 in the air. 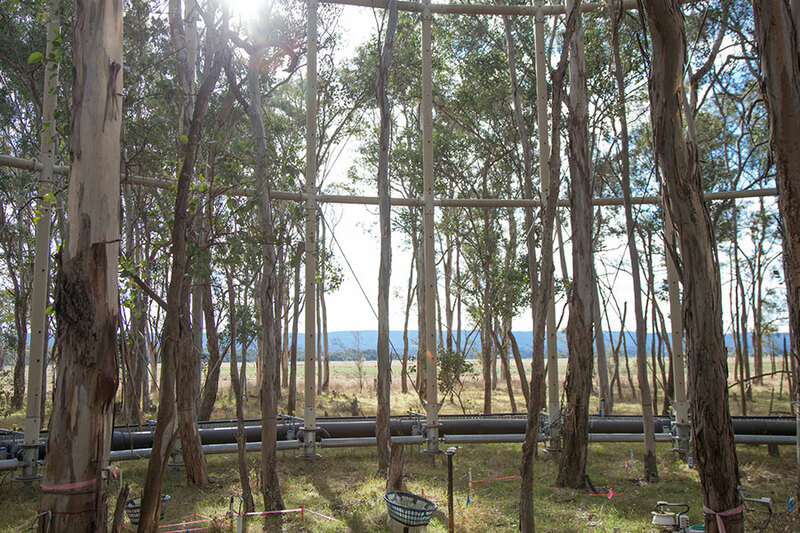 This is quite the reverse of what scientists expected to find based on experiments from international research and is another example of the importance of tailored experiments specific to Australia's unique ecosystems. "This research demonstrates that water availability in Australia has a big impact on increasing plant photosynthesis together with increased carbon dioxide", according to lead scientist at EucFACE, Professor David Ellsworth. 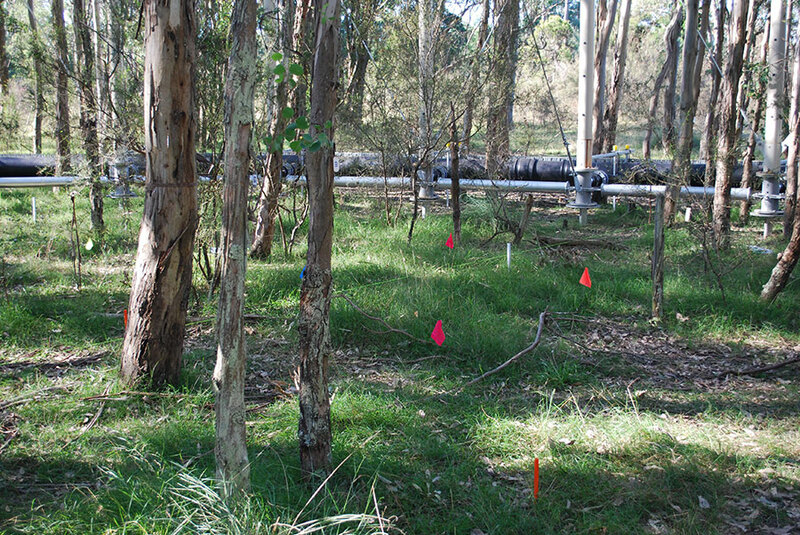 "Results from similar experiments running in cold temperate climate grasslands are quite different in their response to the results here in Australia. Here in Australia at EucFACE, we essentially show that there is no water-savings effect from rising CO2." "Currently, global climate change prediction models are based on data that indicates that grasslands will increase their rate of photosynthesis under rising CO2, whereas in fact changes to ecosystems such as increased growth, increases in woody seedling establishment or establishment of different types of plants in the ecosystem are more likely to be the result of fluctuations in water and not as a result of extra CO2." EucFACE with green, well-watered grasses after decent rainfall. EucFACE with dry grasses in the understorey. Previous research from satellite imagery has demonstrated a trend towards 'global greening', attributed to increased CO2 thought to enable plants to use less water and therefore stay greener. "Satellite imagery can tell us about what has happened in the past up to today", explains Professor Ellsworth. "What the world is looking for and what EucFACE provides is what will happen starting today and going into the future. These results indicate that the big changes in carbon absorption by CO2 happen when there is enough rainfall and moisture. In Sydney the climate frequently swings from wet to dry and back again so often that this has much more impact than in other more consistently wet or dry regions. We can expect in the future that the changes in rainfall brought on by rising CO2 as well as the direct effect of CO2 on plants will interact". Varsha Parthare, the lead author of this publication, is completing her PhD at Western Sydney University's Hawkesbury Institute for the Environment. It is a terrific achievement to secure a first publication in the prestigious journal Global Change Biology, among the most highly regarded journals in the environmental sciences. "As an emerging scientist, EucFACE was the ideal learning ground to build up excellent scientific skills and make professional connections in science and the environment. "Most of all, though is what where I see my purpose and that's where it has been really exciting – to be able to see into the future at EucFACE and provide answers to what tomorrow's environment might look like. All of us will be affected by climate change in our lifetimes and it has been very special for me to be part of this unique effort in Western Sydney. "There is nowhere else I could have conducted research in such an innovative facility, addressing the Australian questions about how our world will change in my own lifetime and beyond."